Touch in Real Time is a national, multi-year project initiated by artist Holly Hanessian. It is a combination social engagement, scientific research project, and series of exhibitions. Hanessian collects handshakes across the country as she works with a neuroscience team, and ultimately presents a series of exhibitions at galleries and museums. Touch in Real Time explores the power of touch through the act of shaking hands at the intersection of art, emotion and neuroscience. 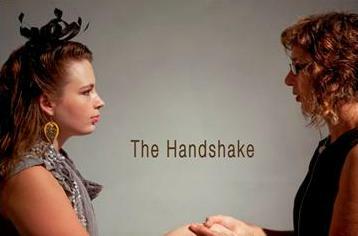 Participants will shake Hanessian’s hand after a wet piece of clay has been placed between their hands and hers. She will hold onto participants’ hands for 10-15 seconds until the bonding hormone oxytocin is released. The clay will have imprints of the participants’ hands and hers, which will become part of an installation exhibited in the fall of 2013 at the Society for Contemporary Craft in Pittsburgh, Pennsylvania. Holly Hanessian, Professor of Art specializing in ceramics at Florida State University, has chosen the Ohr-O’Keefe Museum as one of the venues for her project. Come by the Museum on September 14, 2013 from 2:00 to 4:00 pm to participate!